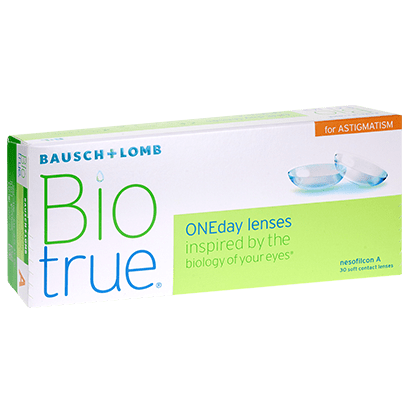 Created by eye care experts Bausch & Lomb, Biotrue ONEday for Astigmatism contact lenses is a toric contact lens that ensures uninterrupted, undistorted and stable vision for contact lens wearers who suffer from astigmatism. Be sure of exceptional comfort and convenience when you wear these daily contact lenses for your astigmatic correction. These stable contact lenses retain their position on your eye, moving with your eye as it moves and delivering uninterrupted vision. You won’t have to worry about halos, blurred vision and other distortions when you wear these daily contact lenses for astigmatism. 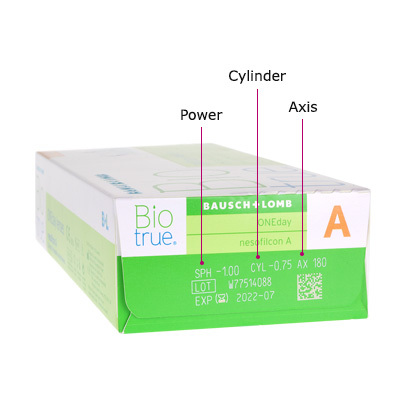 Biotrue ONEday for Astigmatism contacts have been designed for up to 16 hours of wear, at which they’ll have maintained as much as 98% of their moisture. This equates to a moist and comfortable contact lens that keeps your eyes hydrated and feeling fresh all-day long. Dryness caused by factors such as air conditioning and computer screen use will be a thing of the past with these ultra-comfortable toric contact lenses. The pinnacle of convenience, these daily disposable toric contact lenses have been specifically created to offer a long-lasting daily wear option, with the lenses able to stand up to long days, late nights and early starts. After enjoying a full day of clear vision and astigmatic correction, you can simply remove your lenses and throw them away before you go to bed. The next morning, you can pop in a fresh pair of Biotrue ONEday for Astigmatism contact lenses and enjoy the exact same benefits with new lenses. You can rely on total hygiene by wearing new daily contact lenses every day, while you won’t have to bother about maintaining a contact lens cleaning schedule.